Last october Jesús Gamarra visited Pisac together with Graham Hancock Pisac (or Pisaq), one of the places where Jesús Gamarra explained about the theories of his father Alfredo Gamarra to famous author Graham Hancock. Inca Pisac is a great site in the Sacred Valley of the Incas. Several building styles can be seen here, according to Gamarra not all from the Incas. Only the most simple style would have been made by them. A beautiful site with great views on the surrounding terraces, the stonework and the scenery of the Sacred Valley. The ruins are spread out on the mountains above the town of Pisac. There is a large agricultural section with terraces. One should allow for at least a couple of hours to visit, which at the same time, together with the tough walk inside of the complex, is a factor that seems to limit the amount of tourists that really visit the place. More people go to Pisac for the market, well worth it also, but to my opinion there is no comparison with the Inca site above the town. If you have time enough, you can even take a climb up there from the town, instead of taking a taxi up to the entrance of the site. The site is known as Inca Písac, and it seems to have been made to keep an eye on an entrance into the Sacred valley of the Incas. The place consists, along the ridge of the mountain, of four areas: Pisaqa, Intihuatana, Q'allaqasa, and Kinchiracay. Mosat interesting part is The Intihuatana group, which includes the Temple of the Sun, baths, altars, water fountains, ceremonial platform, and an intihuatana, an outcrop carved into the mountain, an "hitching post for the Sun" (or Inti). According current ideas it would have served to define the changes of the seasons. Than we have Q'allaqasa, which is built onto a ridge that overlooks the valley, also known as the citadel. The Inca constructed agricultural terraces on the steep hillside, which are still in use today. They created the terraces by hauling richer topsoil by hand from the lower lands. The terraces enabled the production of surplus food, more than would normally be possible at altitudes as high as 3000 meters above sea level. The narrow rows of terraces beneath the citadel are thought to represent the wing of a partridge (pisaca), from which the village and ruins get their name. 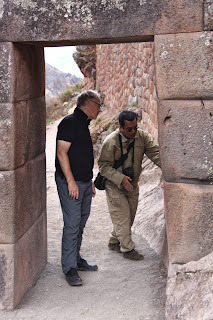 Contrary to some of the above information of this site only being from inca time, the different qualities of the masonry of the buildings might not have to do with differences in rank or social status of the Incas but could be from different time periods. Jesús Gamarra on the pictures below (go over the pictures with your mouse to see the comments), was showing Graham Hancock exactly this. The intihuatana as important monument was respected and built over by later cultures. Only the last and most simple building style would have been made by the Inca's. Interesting details as vitrified stones and the traces on underlying blocks left by upperlying blocks, are explained by Jesús, details that can also be found at the other Inca sites, and on world level. See the pictures below made by Walter Meekes. If the electric universe theory and Sitchins' theory and Milton/DEGrazie theory and Velikovsky theory can all be part of a remade theory that sees the Earth actually being expanded with substantial earth lava from below and substantial meteor dust from above we might make progress in understanding our past. Perhaps our resonance changed due to its increase on size?